1. Preheat the oven to 200˚C, gas mark 6. Cut the squash into 1cm-thick slices, put in a roasting tin and toss with the olive oil; season. Cut ¹⁄ ³ of the butter into cubes and scatter over. Cover tightly with foil and roast for 30 minutes, then remove the foil and roast for another 10-15 minutes until golden. 2. When the squash is almost done, cook the broccoli in boiling salted water for 4-5 minutes, until just tender. Drain thoroughly; set to one side. Melt the remaining butter in a pan over a low heat. Stir in the chilli and parsley; season. Transfer to a bowl and add the lemon halves to the pan, flesh-side down. Turn up the heat and fry briefly until slightly charred. 3. 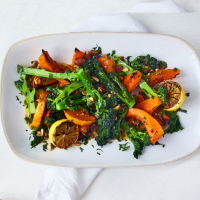 Arrange the vegetables on a plate, scattered with the almonds and the spiced butter drizzled over. Serve with the charred lemon halves alongside for squeezing.